Voice typing for Google Docs was introduced by Google about six months ago. Now Google Docs came up with an amazing feature and moved its voice feature one step ahead. Voice typing for Google Docs on the web allows you to dictate your text into a document. This means that all you have to do is to dictate your text to Google Docs and it will type it for you. After a successful launch of voice typing, Google provided more feasibility to its users by introducing voice commands. Now it allows you to edit and format your text by your voice. This means that if you want to select all the text in your document then instead of pressing “ctrl+a”, just say “select all” and Google Docs will do the task. 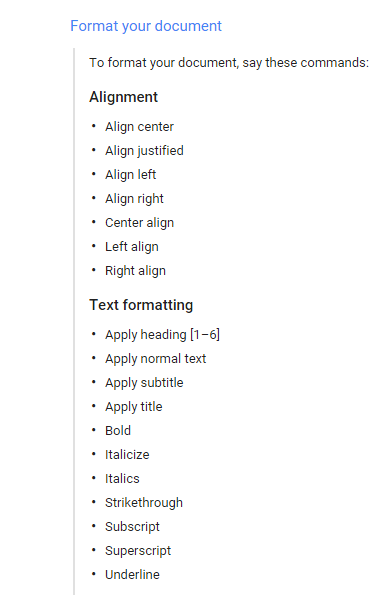 Now you don’t have to remember the shortcuts but can say things like “align center”, “italic”, “bold”, “increase font size”, “decrease font size” and many more. The extensive list of commands includes much more than this. What you could possibly do for formatting and editing to your document, is now available in voice commands for Google Docs. The only limitation is the ability to add special characters. Google also provides a complete list of available commands. You can also ask for help by saying “voice commands help” and it will pop up all the available commands for your ease. There are hundreds of commands so it will take some time to remember all the commands. The new voice commands are available in Google Chrome. You can find this feature in “Tools” under “Voice Typing”. Voice commands, after voice typing, is an amazing addition of Google Docs. If you have any query regarding how to edit and format using voice commands then please let us know in the comments below.